TVS FFA chapter members Hannah Pemberton (left) and Kallen Pitz (right) presented information about the Washington Leadership Conference during the board of education meeting on Monday, Feb. 26. The chapter has never been to the conference, but has chosen four dedicated members to attend this year, if they can raise enough money to cover the cost. They are interested in giving their presentation to local groups who might wish to contribute to their expenses. Contact Ag Educator and FFA Advisor Alison Derringer at aderringer@tvs.k12.oh.us for additional information or to donate. WEST ALEXANDRIA — Twin Valley South’s FFA Chapter is trying to raise enough money to attend the Washington Leadership Conference (WLC) this summer. The conference experience is available to any FFA member, but many are unable to attend due to the cost and accessibility to Washington D.C.
TVS FFA has never attended the conference before, but this year they hope to raise enough money to bring a small four-person group to the conference. In hopes of raising those funds, two chapter members made a presentation to the Twin Valley Community Local Schools Board of Education on Monday, Feb. 26. The chapter is interested in presenting to local groups who might wish to contribute to their expenses before and after attending WLC. According to the National FFA Organization, “The WLC curriculum is based on the four tenants ME, WE, DO, and SERVE. Building upon each of these four tenants gets students to the overall objective of the conference which is becoming an engaged citizen who can make a measurable positive difference in their community. “Each of these tenants are taught during a full dedicated day of the conference and through the context of our nation’s capital, Washington D.C. The Washington leadership conference is a delicate balance of providing FFA members with a premier leadership experience while exposing them to the rich history that DC has to offer. Chapter members Hannah Pemberton and Kallen Pitz presented information on WLC. The girls began by playing a WLC promotional video, and followed up with thier pitch to the board. “We’re looking for sponsors, because it costs just over $1,200 per student. I started a fundraiser selling carnations and it made about $80,” Pitz said. FFA Advisor Alison Derringer added, she hopes to have the funds by the middle of May at the latest. The conference costs roughly $900 per student and the rest is airfare. The $1,200 covers all of the students expenses. Superintendent Bob Fischer suggested looking at other service organizations and giving them presentations, which Pitz said they would be willing to do. The students will also be meeting to discuss other fundraisers they could hold. 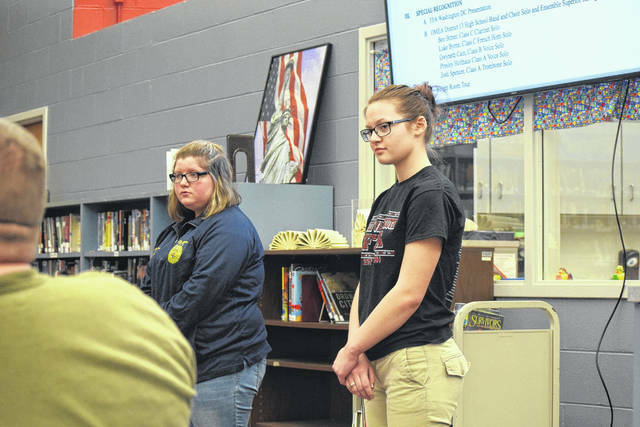 https://www.registerherald.com/wp-content/uploads/sites/41/2018/03/web1_DC.jpgTVS FFA chapter members Hannah Pemberton (left) and Kallen Pitz (right) presented information about the Washington Leadership Conference during the board of education meeting on Monday, Feb. 26. The chapter has never been to the conference, but has chosen four dedicated members to attend this year, if they can raise enough money to cover the cost. They are interested in giving their presentation to local groups who might wish to contribute to their expenses. Contact Ag Educator and FFA Advisor Alison Derringer at aderringer@tvs.k12.oh.us for additional information or to donate.